The Unknown, Entertaining Mind of Miss Dena Jones: Steampunk Betty and Update on Blog Candy Winners! Hello, Friends! First of all : WOWWWWEEEEE!!!! What a fantastic turnout last weekend! If you missed it, this past weekend was what I hope to be the first annual "Our Favorite Things Blog Candy Extravaganza" blog hop! There were so many positive responses from both viewers and sponsors. I'm really glad that I was able to introduce many of you to some new companies and to also provide some exposure to some of my favorite sites. I did indicate in my hop post that winners would be notified no later than the 11th of March. I have begun emailing some of the winners already. With so many prizes and sponsors involved, it does take a lot of coordinating. My Mom duties do have to come first, but I should be able to get through the list by the specified date. As a reminder, if your name is chosen, you have 72 hours to respond or an alternate winner will be selected. As for today's project, it's a card I created for Forever Night Challenges. 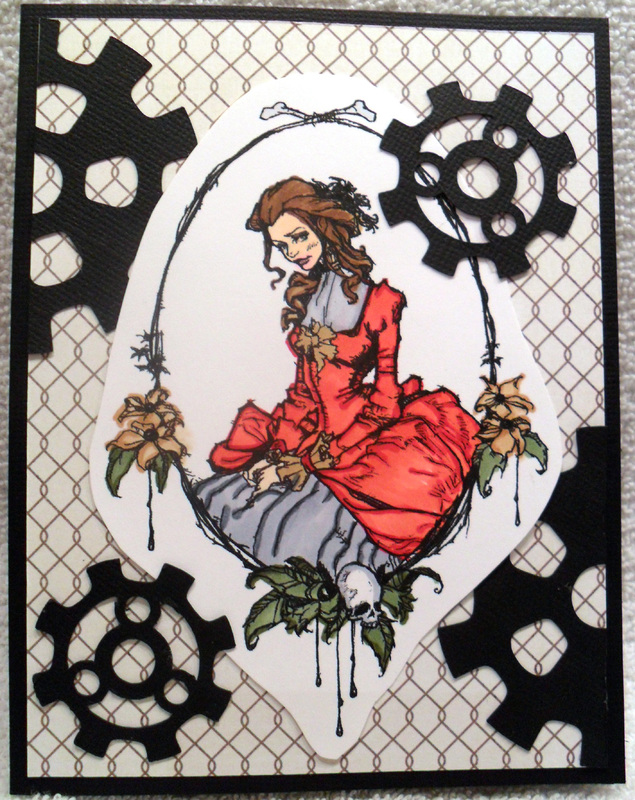 The image is from the steampunk collection by Simply B Stamps. The challenge was : STEAMPUNK. I colored the image with Copics (of course!). I really need to expand my collection, though. I think I'm going to have to treat myself to some in the near future. LOL! 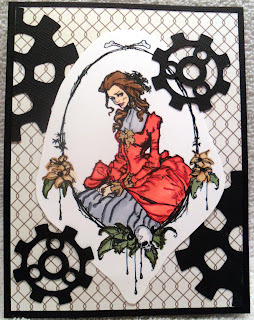 Anywho, the gears were cut with a file from the Silhouette Studio and cut with my Silhouette Cameo. The two large pieces started out as one. I cut it in half so I could place the pieces in such a way that they'd be more visible. I was a little concerned as to how I would pull off the steampunk look as it's not really a genre I've worked with before. In the end, I was happy with how it turned out. Well, thanks for stopping by. Hope you have a great Wednesday! Dena, I think you colored it wonderfully. It really is a great image and you have shown that. Fabulous Job! beautiful card!!! love the image and your coloring!